Intuitive user interface makes it extremely easy to use. Even novice users can easily understand and access all features. Send automated SMS and Email alerts to your Customers, Vendors, Agents and Staff. Remain updated through MIS alerts. 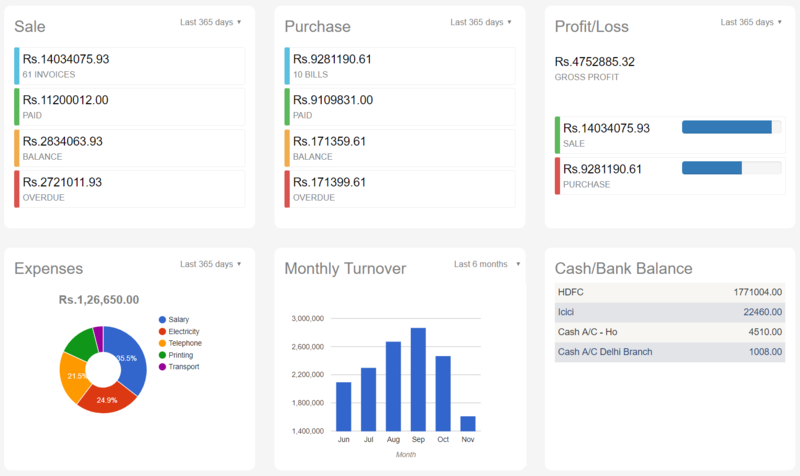 Accounts ERP dashboard shows synopsis of your business. You can customize the dashboard to suite your requirements. Presntation of Accounts ERP from Innovative ERP Solutions Ltd.
Get started 1 - 2 - 3! Sign-up to get instant access to AccountsERP. See how it works for your business. Try before you buy. No credit-card, No payments, No commitments. Once you are satisfied, continue using the same account with real data. Automate your business simply by defining business rules. Create companies, branches, departments, users and configure your account to suite your style. Quickly import Account Heads, Inventory Items using Excel templates. Select the pack suitable for your business and make online payment. Your account is activated within 2 working days. You may upgrade your pack anytime by paying the difference amount. Manage your sales pipe-line and effectively track leads. It simplifies reporting and monitoring of sales team. Data capturing can be automated through Lead integration and API for your web-site, Just Dial, Sulekha, Urban Pro etc. Inventory management with multi-level Inventory grouping. Generate stock-ledger and stock-in-hand report with valuation on list-price, last-price, LIFO & FIFO valuation. Supports inventory for manufacturers with Bill of Materials and Production register. Track amount receivable from your Customers and payable to your Vendors. Send automated alerts for bills due. Link with payment-gateway to automatically create receipts for payments received through net-banking and debit/credit cards. Simplify taxation by quickly generating statutory reports like GSTR-1, GSTR-2, GSTR-3B, HSN-Summary, E-way bills etc. These can be directly uploaded to government portals. Also track TDS deducted and TDS payable. Allow customers to easily create complaints and monitor complaints using ticketing system. Executives update status using their Mobile phones. Send automated alerts for periodic services and expiry of service period. Easily email Invoices and other documents to your Customers and Vendors. Send auto-generated Email and SMS alderts like Overdue reminders to your customers. Also send other customized messages such as New Year wishes. Automate your business by generating event based SMS and Email alerts for your Customers, Vendors, Agents and Staff. Configure the system to send you Event based MIS alerts through SMS and Email and get 100% control of your business. Go paper-less with Document Management System. Attach documents in PDF or JPG format to each voucher and instantly access these documents from anywhere using your Computer or Mobile. Use role-based security to grant restricted access to specific people. You can grant access to specfic features or specific information based on Company, Branch, Department or Location. Get 7 days trial. No credit card required. Copyright © Innovative ERP Solutions Ltd. 2017. All Rights Reserved.